Monday (November 19, 2018) I went fishing south of La Paz. I was looking for the usual suspects: snappers and the odd pelagic. I dove late in the day since I had (online) work to do in the morning. I do like diving later, if only because the local commercial fishermen have already taken their boats out. Normally by 2 pm most of them are either out or waiting to put their boat on their trailer. I haven’t had any real problems with the local commercial fishermen, but one did come to my kayak while I was far offshore, and I could sense he was not happy about my setup making me entirely independent from his services… The truth is I would hire them, but since I am here for so long, it is impossible economically for me to do so except occasionally. Anyway, I try to stay clear of them, so they don’t see me as a problem. So, I dove the bay, not too far from my point of entry, in a spot that is normally full of commercial pangas trolling in all directions. I dove there for about one hour. The depth was about 15 m (50 feet), the water murky and the fish absent. I mean there was nothing except a few parrotfish (which I never shoot out of environmental concerns) and some of the usual reef/aquarium type fish. I moved to deeper water in hopes of finding more life. At about 20-22 meters (66-75 feet), I saw a few larger aquarium fish, but no snappers at all. This wind and strange weather seem to have moved the fish out to sea somewhere. Anyway, I slowly drifted deeper at the border between rocks and sand. That was no deeper than 22-23 meter (75-80 feet) in the area where I was. I have found large yellow snappers at 26 meters in the same area (among them a 13-pound yellow, which was a record but I didn’t know). The sun sets at five thirty. I was still going up and down at five, hoping for a pan fish. I finally shot a palmetto. They are the best in that category for my taste. At about five fifteen the water was getting dark, but I was still diving. I laid down on top of rocks at 22 meters, and a trigger got my attention! 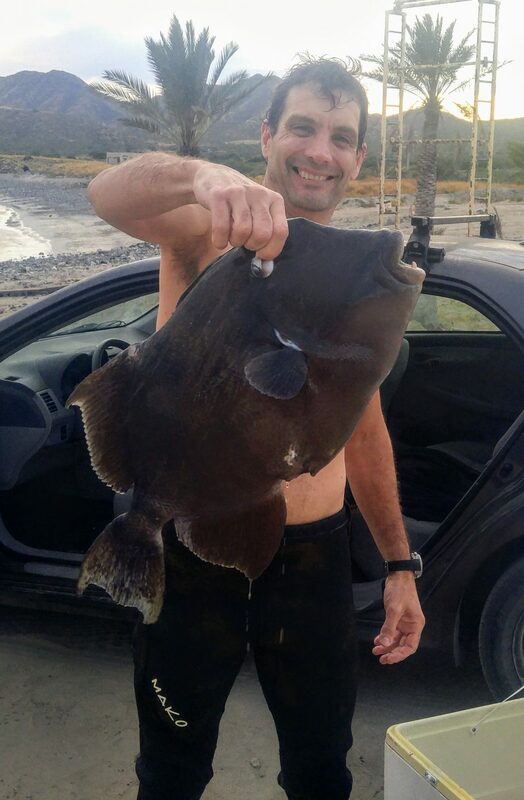 That tough skin fish was huge! I had seen a 20 pounder last year and I still wonder why I hadn’t shot it. That too would have been a record… Anyway, the monster was not getting any closer. Fortunately it offered quite a target, and I was using a 130cm speargun. I shot it low at the edge of visibility. Thank god for that tough skin! That fish went straight for a hole. The shaft got entangled, of course. I decided to go back down to 23 meters after having started my ascent. I was up to about 18 meter. weww! I finally untangled it and I went up. The fish resisted mostly with its profile but it was a long way up now. For some reason, I didn’t use any of the line on my reel. I regretted this… Ten feet from the top I wondered about letting some line out but figured, hey, I’m almost there! Not the smartest decision, but I got to the surface with about 10-20 seconds of margin lol. Total dive time was 1’45”. I really need to do develop better “procedures”. I’ve been doing this since 1986 and I still have to work on my judgment. I guess we are all in the same boat. The trigger was 12.6 pounds. Not close to the record, well above 18.